Blinds are great for adding privacy into the home and blocking daytime glare. Therefore, they have become a necessary addition in homes. However, if your blinds are no more in their perfect shape, then it means that you need to look for new ones. If you desire to replace your window blinds and shades, there are many factors that you need to take into consideration. As you assess each room in your house, you will have to ask yourself some fundamental questions to assist you in coming up with the look that you want to attain. Once you've decided on the general appearance, review the different window treatments that you'll incorporate. Most people want their home rooms to be well lit, while others opt for a softer glow. At times low light is necessary if you have huge TV's or other electronic devices that get washed out by heavy light sources. The window coverings that you choose will determine the amount of light that will penetrate the room from outside. Another factor that you should look at is the level of technology you desire in the room. Many people go for the "plain and simple" approach by using manually operated blinds, while others search for remote control or automated window blinds and treatments. The chief idea to remember is that a more complicated setup of the blinds will cost you more money. Wood - This is a good option, which you can purchase in different slat sizes ranging from 1/2" to 2". Most wood blinds are manufactured with the use of lightweight woods that are known for reducing stress on the mounting system. 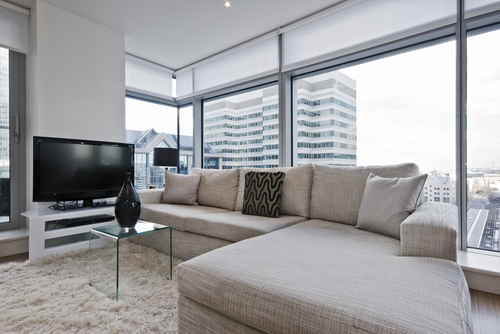 Aluminum - This is the most common material used in window coverings today, particularly in a mini blind format. They are popular in workplaces, and even in large living areas. You can choose from the variety of colors available, though whites and other neutrals are quite standard. Vertical - If you want an attractive covering for your sliding glass doors, this is a great option since you can draw them open or closed, from one side to another or anywhere in between. Vertical blinds are durable, lightweight, and easy to clean. Faux Wood - These highly durable blinds are made from various man-made materials and are very easy to maintain. 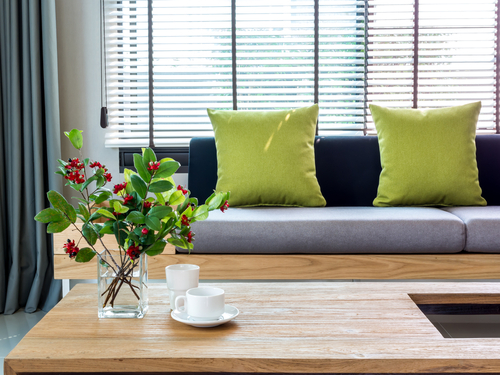 Faux wood is typically used in horizontal blinds or shutters. If you have large windows, it's best to use two sets to redistribute the weight. Your budget will be the most important factor in your window shade selection. You can always stay within your budget by breaking the project down into smaller bits, spreading out the cost of the entire project over a longer period of time. You can also consider using cheaper materials or products to achieve the same look. The typical setback of cheaper shutters is that they may wear quicker, which will result in spending more money on early replacement. If you are unable to decide whether it is time to change your blinds or not, check a list of signs that will make the decision easier for you. Apart from privacy and light blockage, blinds are also used as decorations for the home. So, if you are renovating your home and want to make it look appealing, you should change your old blinds with new ones. If the entire home has been upgraded, but you leave the old blinds on your windows, then your interior space will look untidy. In order to add finesse to it, you should definitely buy new blinds. If you have cats or dogs, then you might be aware that these pets are fond of climbing blinds or peeking through them. This mostly happens with wooden blinds. So, if you have pets and they have damaged your blinds or scratched them, then it is time to get new ones. When you are preparing to sell your home, it is best to install new blinds to increase your home's value. Because blinds add privacy, protect the interior from sunlight, and decorate the home, they are considered a valuable addition. When you replace your old blinds with new ones, you will be able to attract more buyers. Blinds also add instant appeal to any space and create an illusion that the windows are larger. If you have moved into a new home and are in the process of decorating it, then you should consider replacing the old window blinds and purchase new ones. New blinds will make your interior space more appealing and will add extra oomph to your newly decorated home. Furthermore, these blinds will help add privacy to your home. Blinds often get worn out with time and no matter how high quality blinds you bought, there will be a time when they will become messy and damaged. Therefore, if your blinds have been on the windows for a long time and showing signs of aging, then know that it is time to replace them with new ones. No matter how many times you clean your blinds, they will begin to develop stains. So, if your blinds look untidy or unclean, then know that it is time to get new ones. Sometimes cleaning products also stain blinds, which makes them look unappealing. So, if your blinds are no longer getting cleaned, hit the market and buy new ones to decorate your windows. If you have medium to large sized windows, having them would be very helpful since you get to control the amount of light that goes through your windows. They can help you save on electricity, too, as they function as light filterers. Aside from this, they keep your living areas well-ventilated and the room temperature even, thus, it doesn't get too hot or too cold depending on the season. Since they are also decorative room furnishings, having shades will help preserve the look, texture and material of your other furniture. To be exposed to too much sunlight is a guarantee for shorter lifespan of your room furnishings. Blinds are available in a variety of materials, colors, and designs. Costs are also relative depending on the window treatment style you choose. To ensure they last longer despite repeated use, follow maintenance guidelines as specified by the manufacturers. Cleaning or regular dusting of your blinds is a common tip that manufacturers say will increase durability and lifespan of the product. Regular vacuuming is another way to clean them. However, make certain that you use the proper cleaning materials if you choose to manually clean the blinds instead of using mechanical options. You don't want to leave stains or smells on your shades made of fabric. While cleaning, check all blinds slats to make sure all pieces are still secured tightly with strings. This will ensure that the slats rotate properly and light penetration is properly controlled. Untwist all coiled cords so that blinds can be raised and lowered evenly. Look for damaged blind clips and replace old slats that need to be changed. This will help in the smooth operation of your blinds.